A Stingray City adventure could be the highlight of your vacation. Enjoy the unique experience of touching and feeding a Southern Stingray, together with snorkelling amongst magnificent coral reefs and colourful tropical fish. Start your adventure off at Stingray City’s land base in Seaton’s village; complete with monkeys and parrots, and where their experienced guides will brief you about the Southern Rays. A scenic 5-minute speedboat ride between Antigua’s offshore Islands will whisk you to a shallow stingray pool with a white sand bottom surrounded by beautiful coral reef. 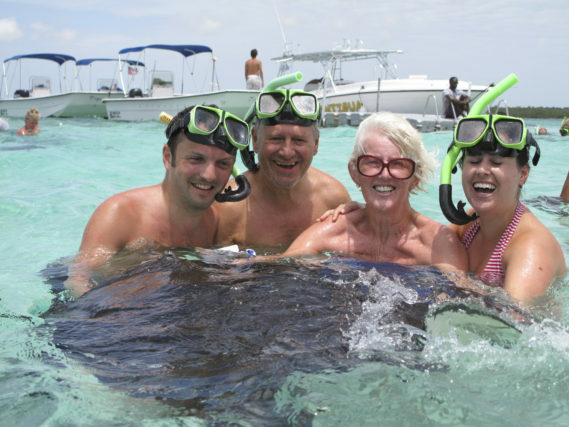 Once you arrive and your boat has been moored, you’ll be escorted to ‘Stingray City’, where you’ll be greeted by the friendly Southern Stingrays with the relaxed familiarity of old friends. Whether you choose to stand or swim you’ll have the unique opportunity to touch, feed and play with stingrays during your encounter, all the while learning about these amazing and captivating animals. The Southern ray is known as the puppy dog of the sea, always looking for attention and a snack. In no time at all you will find yourself spellbound by their gracefulness and beauty, and you will find yourself among the thousands of people who return home wanting to come back. After interacting with the Rays there will be time for you to snorkel amongst the coral reefs and tropical fish before returning to the land base where you can rinse off under the bright Caribbean sun, in a shower on a coconut tree and enjoy a complimentary rum or fruit punch.